Clint Eastwood Approves of Saturday Night Live Skit: Bill Hader "Has Me Down Pretty Good"
If you think Clint Eastwood has a problem with being mocked on Saturday Night Live, think again. The Oscar winner, and Mitt Romney supporter, has no beef with being made fun of last weekend on the hit comedy sketch show for his now infamous Republican National Convention speech. "I liked it," Eastwood told E! News at last night's L.A. premiere of Trouble With the Curve. "It was good. [Bill] Hader has me down pretty good." Check out the SNL clip here! During last Saturday's episode of SNL, Hader impersonated Eastwood by taking the acting legend's infamous RNC chair and invisible Barack Obama on the road for a comedy tour. Despite his speech receiving criticism, Eastwood says he may not be done working with Romney. 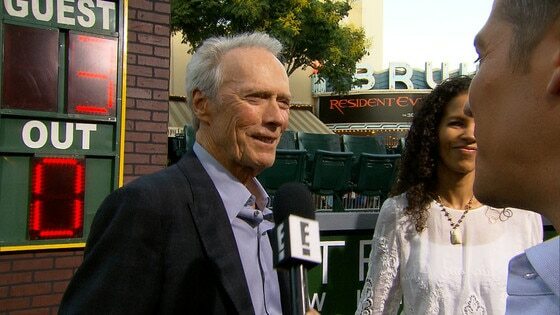 When asked if he's like to do more with the Republican presidential hopeful, Eastwood said, "I don't know. I hope so." Meanwhile, Eastwood dished to us about his upcoming remake of A Star Is Born. The 82-year-old tells us that reports Bradley Cooper was in talks to sign on to the flick were more than just rumors. "We were talking to Bradley Cooper," he said. "We've talked to several people, and we probably won't address that one till next year. Early next year." Eastwood says it's not even confirmed that Beyoncé, who's long been attached to the project, will be a part of the remake. "She's great," he smiled. "I don't know if she's available, but we've talked a little bit."